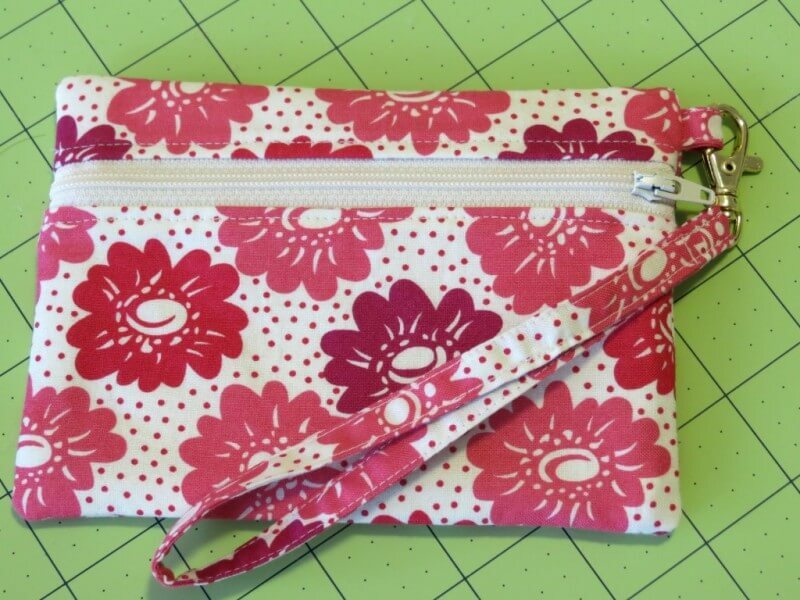 A zippered pouch is a great sewing project, especially for beginners. The thought of working with zippers can be intimidating to new sewers. But making a zippered pouch allows you to practice working with a zipper on a small, easy project. You can make a zippered pouch to hold just about anything. But, in this tutorial, we’ll be making a pencil case. Four pieces of fabric that measure 8 inches by 4 inches. An 8 inch, closed bottom zipper in a coordinating color. Thread in a coordinating color. A tape measure or ruler. Here are some specifics to keep in mind when gathering your supplies. 1. Choosing your fabric. 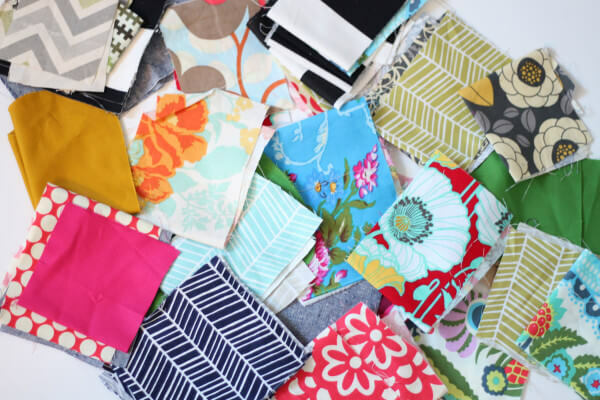 You have several options when it comes to choosing fabric for your pencil case. As stated above, you’ll need four pieces of fabric to make your pouch. Two pieces of the fabric will go on the outside of the pouch, while the other two pieces will go on the inside. You can use the same fabric for all four pieces, especially if you have scraps of a particular fabric that you want to use up. Or you can choose a patterned fabric for the outside pieces, and a coordinating solid fabric for the inside pieces. And if you really want to be wild and crazy, use four different fabrics for your four pieces. For this project, cut your pieces so that they are 8” x 4”. The important thing here is that you want your fabric to be the same length as your zipper. So, for our pencil case, we are using an 8 inch zipper, and fabric pieces that are 8 inches in length. If you want your pencil case to be slightly bigger, but you want to use the same sized zipper, you can cut your fabric pieces so that they’re 8” x 5” inches, or even 8” x 6”. 2. Choosing a zipper. Choose a zipper in a coordinating color to the fabrics you’ve selected. Choose a zipper that matches or complements the color of the pouch fabric. Standard pens and pencils are about 6 to 7 inches long, so we’ll use an 8 inch zipper for our pencil pouch. If you want your pouch to be slightly longer, simply choose a longer zipper. 3. Choosing thread. Use thread in a color that matches the fabric and zipper. Or at least use thread in a neutral color that won’t clash. 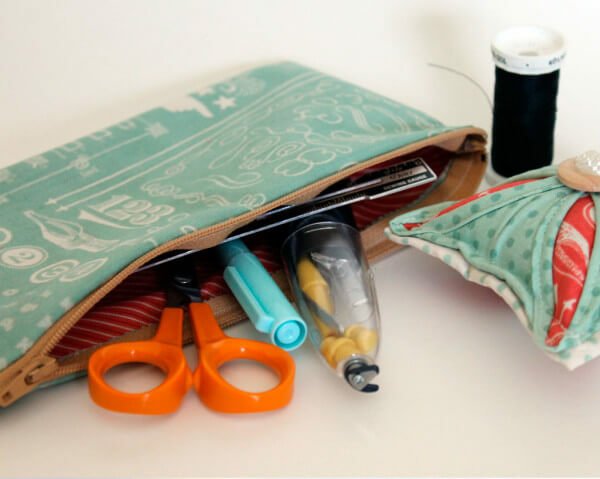 Once you have your supplies, it’s time to make your zippered pencil pouch. Lay one of your “inner” pieces of fabric face down on a table or other flat surface. Take the zipper (which should be closed at this point) and lay it face up on top of that first piece of fabric. Make sure the fabric is between the zipper’s top stop and bottom stop. You also want the top of the zipper to line up with the top of the fabric. Take one piece of your “outer” fabric and lay it face down on top of the zipper. Again, you want the top of the fabric to line up with the top of the zipper. Use straight pins to pin the three pieces together. You want to place the pins as close to the zipper as you can get without actually touching the zipper. Now it’s time to head over to your sewing machine. Use a straight stitch to sew the three pieces together. Sew as close to the pins as you can without hitting them with the needle. Fold the pieces of fabric out and away from the zipper. Basically, you want the “backs” of your pieces of fabric to be pressed together. Use an iron to give the whole thing a good pressing. Repeat steps 1 through 7 on the other side of the zipper, using the remaining pieces of fabric. When you’re done, you should have a piece with a zipper in the middle, two pieces of fabric on the left, and two pieces of fabric on the right. If you lay the piece on a table with the zipper face up, your “inner” fabric should be on the bottom and your “outer” fabric on the top. Take the two pieces of fabric on the right side and fold them up and over so that they cover the two pieces of fabric on the left side. Make sure the edges of the fabric line up, and then use straight pins to pin the fabric pieces together on three sides (what will be the two sides and the bottom of your pencil case). Give yourself a seam allowance of about ¼ of an inch on all three sides. Open the zipper enough to give you about a one-inch opening. Sew the pouch around the three sides (along the bottom, the right side and the left side). Turn the case inside out. To do this, push the fabric up through the opening in the zipper. Use the iron to press the pouch flat, paying special attention to the corners. And there you have it. Your brand new, homemade pencil case is finished and ready to fill with your favorite pens and pencils. What If You’re Making Something Else? You can use this method to make zippered pouches to hold just about anything. Really, the only limit is your imagination. Whether you’re making a pouch for loose change or recipe cards, the first step is estimating how big your pouch needs to be for what you want to put in it. For something like a change purse, just pick a size that seems about right and make your pouch. But if you want to make the pouch to hold something of a specific size, you’ll need to measure. Say you want to make a pouch to hold 4” x 6” recipe cards. You’d probably want to use a 8 inch zipper, and fabric pieces that are about 8” x 6”. Adding two inches to the length and width will account for the thickness of your stack of cards, and the seam you’re going to sew around the edges of the pouch. Now you know how easy it is to make a zippered pouch. So why not try making one of your own? Previous post: Learning to Sew? Take It Slow!